Symbols*: Jaguars are mystical creatures that possess the powers of darkness. Primitive instincts reflect the shadow aspects of the psyche. If we tap into inner shadows and allow them to manifest in a productive manner, we will be able to access a wealth of energy that can facilitate ambition and drive. The forest represents the material world. The exterior world can influence dream states. The moon influences the psyche and enables shadows to emerge. The tree roots serve as a bridge between the ego-driven subconscious and the more collevtive elements of the unconscious psyche. The medallion represents the sun and serves as a reminder that we need the balance of day and night. Dreams are changeable and sometimes elusive, much like the low-level fog that obscures the earth. But within the dream realm, we can learn to harness energy and inspiration that can be applied to our waking lives. Description*: Ahau Kin is the Mayan sun god who was connected to both the daytime aboveworld and the nocturnal underworld. Once the sun sank into the horizon, Ahau Kin assumed the shape of a jaguar and roamed the nocturnal landscape. His markings are symbols of his connection with the divine cat. During the day, he would transform back into his human appearance. The sun god could cause human suffering by burning crops during times of drought. The jaguar was considered to be one of the most sacred animals of the Mayan culture. Its countenance was carved into some temples as a means of honouring the god. Possible Meaning: Ahau Kin’s ability to traverse the nightly forests in the form of an animal is a reminder that we, too, should try to recognize our own internal animalistic strengths in order to pave new roads of ambition. The inner animal spirit that is represented by the shadow in our psyches can provide the essential ingredient for financial success. Without the stamina of our strong inner animal, perhaps we would become too easily discouraged in the face of obstacles. Analyze dreams and tap into your own inner animal energies as a means of striving for success. Plan carefully and identify the means you must take in order to pursue goals for a more financially robust future. Thoughts/Points to Ponder: This king is reliable, supportive, steady, and a good provider. He will support us in our efforts, and provide for us when we need him to. He is a reminder of our animal force, and animalistic strengths. The inner animal spirit will help to guide us in the right path. 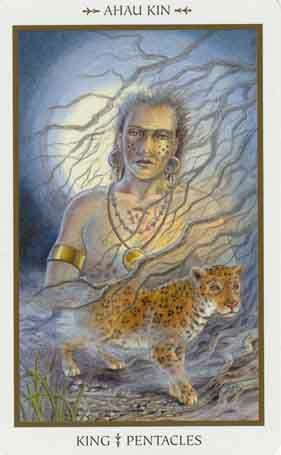 Jaguar enhances spiritual and psychic vision with a keen sense of awareness, pinpointing strong intuitional abilities. Jaguar shows how to embrace the gifts of the Spirit with composure, tenacity, fortitude with a complete integration of lessons learned and applying them in daily life. Are you integrating ideas and thoughts like you should? Jaguar will aid in this transition of self-actualization. He shows how to move silently, stealthily knowing when and how to react, shows empowerment, teaches how to maneuver and understand things unseen. He cuts through the illusion of separation and shows how the hurtful lessons of the past can be transformed into a higher clarity of purpose with a higher sense of self and connectedness. Jaguar's wisdom will show clarity in the chaos in the soul process of integration and shifting perspectives with balance and grace. A Jaguar totems gives you a guide to help you on your path – in the form of a real person – a mentor or teacher.